Beverages are permitted if in spill-proof containers; however, food is allowed only in designated areas. 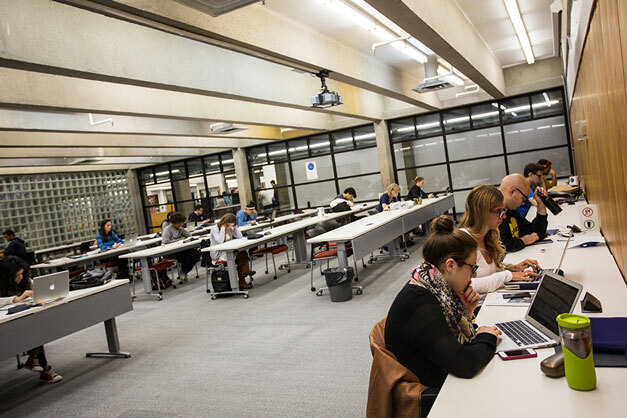 The Library provides a variety of study spaces at Webster Library, Vanier Library and in the Grey Nuns Building including spaces for silent study, a keyboard-free zero noise room, bookable group study rooms, and various collaborative spaces for quiet group work. The Library is a quiet space on campus. In collaborative spaces, speaking softly is permitted. No talking, whispering or noise is permitted in areas designated as silent study spaces. Food is not permitted in the Library except for in designated areas. Beverages are only permitted if in spill-proof containers. Webster Library has 22 different learning spaces designed to fit your needs. Silent study spaces include closed reading rooms, computer classrooms, and designated areas within the Library indicated by signage. No talking or conversation is permitted. Silence is required in these spaces at all times. 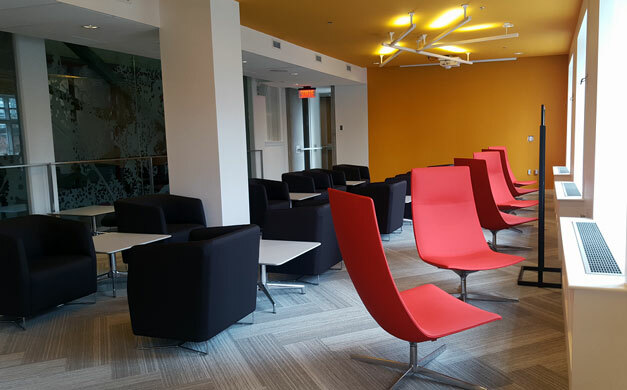 Collaborative spaces include bookable group study rooms and designated areas within the Library indicated by signage. Speaking softly is allowed in collaborative areas, but not loud talking. Long cellphone conversations should be done outside of the Library. Webster Library Unenclosed areas (i.e., spaces between Reading Rooms, tables along the side of the atrium, tables on LB-3 and LB-4 along MacKay St. The Friends of the Library Room located in LB-361 is a zero-noise room that has been set aside to provide a peaceful oasis for quiet reflection. Absolute silence is required in the zero-noise room. No keyboarding or talking is permitted. Areas specifically for graduate students are located on the 5th floor of the Webster Library. In the Webster Library, graduate students may access these areas by scanning their Concordia ID card. Students must go to the Webster Loans & Returns Desk during service hours to obtain a shelf and/or locker in the Webster graduate study space. Find out more about Webster Library's Dissertation Writers’ Rooms. On the above dates, requests for lockers and shelves can be made at the Webster Loans Desk (see opening hours), near the entrance to the Library, and will be treated on a first come first served basis. Shelves can be requested anytime during the year. More information about the lockers and shelves. 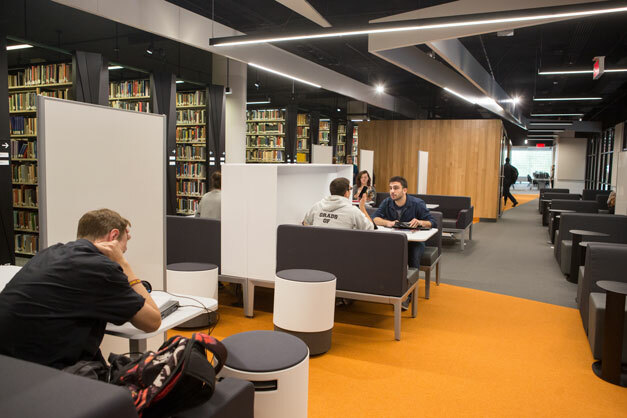 To ensure a quiet study environment for all users of the rooms, no group discussions are permitted in the enclosed areas. In the Webster Library, food is permitted only in the kitchen beside the graduate students' lounge. Graduate study rooms are accessible when the Webster Library is open for study. The Vanier Library Graduate Study Room is located in VL-307. An additional room where graduate students may meet with someone is located in VL-305. A valid Concordia student ID must be presented to obtain an access code to the Graduate Study Room. The code is assigned to an individual student and must not be shared with others. For security reasons, the room is open from 7 a.m. to 11 p.m. Please leave the room when Security agents do their rounds. The Graduate Study Room (VL-307) is shared by several graduate students. Students may “borrow” a shelf for keeping library materials. Shelves are assigned for a one-year period, with the expiry date being September 30. Shelves are assigned on a first-come, first-served basis. No personal items, food or drink should be kept in the Graduate Study Room. If these items are found in the room, they will be removed. Please note that, to promote a quiet study environment for all users of the Room, no group discussions are permitted in the Graduate Study Room. Library books that you want to keep on the shelf must be checked out at the Circulation Desk. The items are assigned to a shelf for a year. Any items assigned to the shelf will have a flag that corresponds to that year (one book/one flag). An item found without a flag will be removed from the shelf by Library staff. You are encouraged to return material that is no longer needed to the Circulation Desk. All material kept on a shelf must be returned or renewed by the due date indicated on the slip. The Library reserves the right to remove any materials that have been recalled/requested by other users after an initial 2-week loan period. Each study room contains: 1 table, 6 chairs, a 46" LCD screen (or two 42" LCD screens in the LB-2 study rooms) with wired (HDMI, DisplayPort) and wireless connections, a wide-angle USB camera and multiple power outlets. The rooms with digital collaboration technology contain one table, six chairs, a 46" LCD screen with wired ports (HDMI, DisplayPort) and multiple power outlets. The group study rooms at the Vanier Library are unavailable between 11pm – 7am. The rooms with digital collaboration technology contain one table, six chairs, a 46" LCD screen with wired (HDMI, DisplayPort, DisplayPort) and wireless connections, a wide-angle USB camera and multiple power outlets. Read more about the group study room technology in the Grey Nuns Reading Room. Rooms are meant to be used by groups who need to discuss Concordia related courses and projects. Rooms are for people affiliated with Concordia University (current students, staff and faculty). Priority use is given to those who have booked the room. Empty rooms may be used without prior booking, however; they must be vacated if a group with a valid booking arrives. Bookings at Webster Library become invalid if the room is not claimed within the first 30 minutes. After the first 30 minutes, the booking becomes invalid if at any point the room is left unoccupied. Bookings at Vanier Library and the Grey Nuns Reading Room become invalid if the room is not claimed within the first 15 minutes. After the first 15 minutes, the booking becomes invalid if at any point the room is left unoccupied. Rooms may be reserved for up to three (3) consecutive hours. Rooms may be reserved up to 21 days in advance. A maximum of one (1) room can be booked per person per day. A maximum of three (3) Webster Library or Grey Nuns Group Study Rooms can be booked per person per week. A maximum of two (2) Webster Library Presentation Practice Rooms can be booked per person per week. Individuals cannot claim group study room bookings. A minimum of two (2) people affiliated with Concordia are required to use a room. If there is only one person using a room, they may be asked to leave. This does not apply to students with disabilities. The Library reserves the right to cancel reservations for maintenance or other unforeseen circumstances. If you agree to the following terms and conditions, go to Booked to make a reservation.